“Reach out your arms, as far apart as possible – one high, one low – then just bend your wrist, but do not look!”, instructed the waitress. “Oh, and beginners like you must stand over the barrel,” she added. I followed her advice exactly but still ended up with a soggy shirt-front and damp shoes, wasting half a bottle. Thanking him for his advice, I sat back and looked around the white-washed room from my seat against the wall. Cut-off barrels half-filled with sawdust littered the blue-tiled floor between tables, along with the usual jumble of crumpled napkins, discarded toothpicks and cigarette ends. Through the open window, small gaily-painted fishing boats bobbed up and down, and their creak and bump as they nagged at their moorings offered a pleasant counterpoint to the hoarse cries of seabirds. My razor clams arrived, redolent of garlic and spicy with piperade, followed by tender hake with softened apples, their acidity perfectly balancing the sweetness of the reduced cider sauce. A side of fried potatoes appeared as another two inches of cider found its way neatly into my glass. Lazily enjoying it, happy and relaxed, I barely noticed when it was all gone and the waitress returned. “Postre?” she asked. “Hay queso de cabrales, flan, y frutas frescas, o si usted prefiere, un poco de cada uno.” I opted greedily for the latter, along with a nip of orujo, she returned quickly with a little of each – blue cheese, stick to your teeth caramel pudding, and a pear. “Ningunas manzanas?” I smiled. “Haven’t you had enough apples yet?” she joked back. 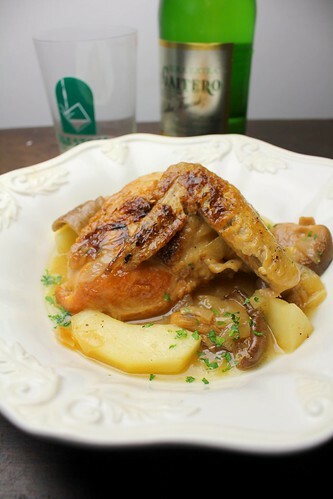 Chicken in cider is not necessarily a traditional Asturian preparation, though it might as well be, so while this dish is modeled on the hake in cider I had that day, it is cooked for much longer. Asturian cider is produced from small, tart crabapple type fruit that are no good for eating, the juice of which is fermented for up to six months in oak barrels. It typically registers only 5% alcohol, compared to the seven or eight degrees common in French and English ciders and is rarely carbonated, hence the habit of pouring from a great height to aerate, followed by swift consumption before the froth disappears. Spanish ciders can be found in the US, but domestic varieties like Woodchuck are perfectly acceptable for cooking with. The chanterelles were added to balance out the sweetness of the sauce with an earthy, autumnal boskiness and some slices of eating apple dropped in with five minutes to go offered some crunch and acid to what is a very satisfying dish. 4-6 cloves garlic, smashed, skins removed. Heat oil to medium-high in large dutch oven, season chicken with salt and pepper, and dust with flour. Brown chicken pieces until well browned on all sides. Remove to a plate, add onions and garlic, and saute for 6-8 minutes until translucent. 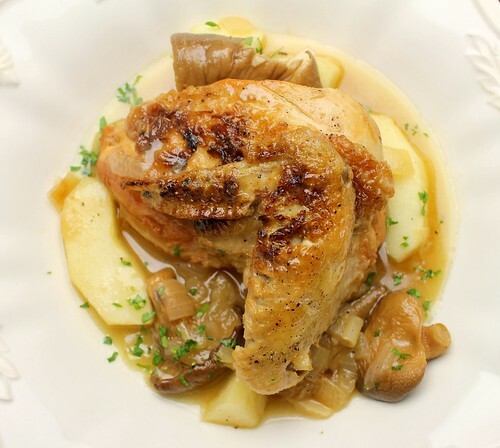 Return chicken to pot, add mushrooms and pour in cider. Bring to a boil and simmer for 1 hour covered, before removing lid, and simmering uncovered for another 1/2 hour. Braising liquid should be reduced by more than half at this point, add raw apples and cook for another 5 minutes. Taste and correct seasoning. Sprinkle with parsley and serve with fried potatoes and plenty of crusty bread to mop up the juices. Yes, it might as well be Asturian, I’m sure there must be some Asturian village where they prepare something similar. Do you know my father-in-law came from Luarca? His family moved to Madrid during the Civil War. My husband used to spend his childhood summer vacations there 😉 In fact we visited Luarca last summer (it poured the whole day!) and we were forced to seek refuge in a weird giant squids museum. I always tell you, I love your writing. Cheers. @Miriam: I did not know that. What a coincidence! It rained the day I was there too, but I think that’s pretty common. I would be glad to spend my summers there, I think. It really is beautiful, except perhaps the squid museum! Thank you, as always, for the compliments! Gratefully received. Goodness, I don’t think I’ve ever been to Asturia but have some niggling memory about the place that I know will dawn on me at 3 am one night soon. Lovely looking chicken and that cider sounds delish… do love all those ciders as a change from wine (since I’m not a beer drinker). Your meal makes me want to visit next time I’m in Spain… the geography is pretty gorgeous! This looks so delicious and one of my food goals this year is to cook more recipes from Spain. This looks completely doable. I love that your posts always come with a dose of “Hemingway” and history. Always a pleasure to read and a delicious bite to eat. Now I need to go look for a bottle of Asturian hard cider to satisfy the craving (thanks to you), and who knows, maybe I’ll find paradise along the way. 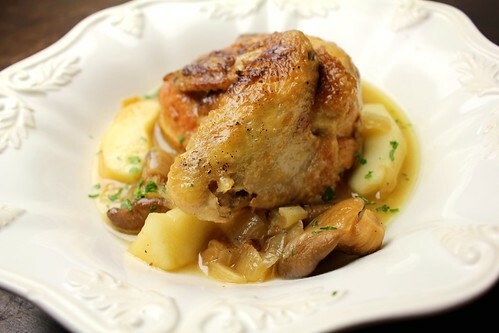 I make a similar recipe from Normany w/ Calvados, it’s so good. Think that will be on the menu this week! Hope you guys are all well. I never would have thought of a Spanish cider. I don’t know why. It’s not as if they don’t grow apples. I have always loved cooking with sweet cider, but have only recently tried cooking with the hard stuff. You’re inspiring me to experiment further. This looks so delicious! Chicken is one of my favorite meals. I will be sure to try this recipe. It’s ages since I prepare this dish… Mmmmmm so good :D.
Last time we travelled to Asturias, my husband asked for a fabada for dinner. I thought he would explode… The owner of the restaurant/hotel scolded my husband because he left a bit of fabada on the plate. @Rachelle: This is a great place to start, dead easy recipe. Almost impossible to mess-up! Buen provecho! @Zen: you’re too kind. I always try to figure out how to include the lines “to die a noble death, in the rain” in my posts. @Rachel: cider’s yet another thing the Spanish do well. It’s hard to go wrong with Spanish recipes. @Nuria: I had the same experience with fabada, except nobody but myself was pushing me to over-eat. At least your husband had an excuse! Great story as always! Love love love razor clams by the way! 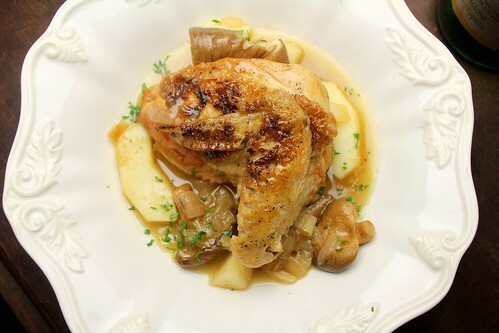 I can imagine how well the cider must go with the chicken in this dish! Is this at all similar to Basque cider? Your description of your experience reminds me of eating in sidrerias in San Sebastian! Darn–I’m all caught up with your excellent posts. There aren’t enough new ones to keep me happy, so I’m going to start over again with the 2008 archives—not kidding, you both really need to put your stuff in book-form. So many less worthy bloggers have done it–I’m ready for some quality work, anyone else? Little P. needs university money after all…. travel book authors : Pico Iyer, Jan Morris, Paul Theroux —I know, you are probably rolling your eyes saying “is she only NOW finding out about these books?? ?” but just in case……. Looks gorgeous! I love the presentation and the story behind this dish. @Emiglia: Yes, very similar to Basque cider. In the Basque country though, it’s more often drawn straight from the barrel in sidrerias. @Deb: you’ve read them all? That in itself must qualify you for some sort of prize. Thanks, as usual, for the kind words. If you happen to know any publishers, of course, we’d be interested! And, I’m a big fan of Paul Theroux and Jan Morris as well as Lawrence Durrell and Patrick Leigh Fermor (for whom Morris often writes introductions). I’ve not read any Pico Iyer, so thanks for that tip. I’ll be definitely be checking out his work! @Cassandra: thanks for visiting, glad you liked it! Thanks for the Durrell & Fermor tips–boy, does Amazon love me!!! I made this chicken today for lunch. I omitted the mushrooms, but otherwise I prepared the dish as written. Simple to put together and really good! Thanks for the recipe.